Alison Martin is a York based professional make-up artist and hairstylist with a passion for creating timeless looks. She prides herself on creating gorgeous bespoke make-up and hairstyles to suit each clients individual style. Since training with top industry professionals at the London School of Media Make-up in 2005 (including a BAFTA winning make-up artist) Alisons career has spanned all corners of the hair and make-up world including published photoshoots, film & TV, music videos, weddings and events all over the UK and abroad. Alison has also worked as an artist for top make-up brands Bobbi Brown and MAC and spent several years as a beauty consultant at the world's most prestigious department store Harrods. 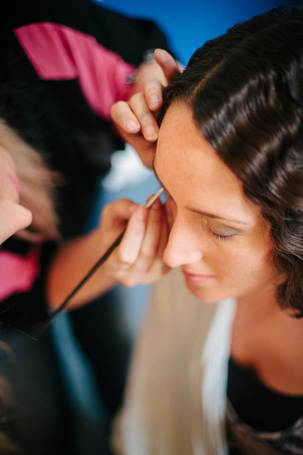 Whether it be bridal clients, events work or commercial photoshoots Alison promises to bring a friendly and relaxed approach to each booking and deliver a high quality hair and make-up service. Her working kit is stocked with high end products from Bobbi Brown, Charlotte Tilbury, Illamasqua, YSL, MAC, Urban Decay, Smashbox, Esteè Lauder, Nars etc. Based in York, North Yorkshire Alison is happy to travel throughout Yorkshire the whole of the UK and abroad (travel prices will be included in your quote). She has her own transport and full public liability insurance. Get in touch if you have any questions or to book your hair and make-up for weddings, special occasions, hen parties, events, race days, make-up lessons, commercial work and photoshoots. The bit for google.... make-up artist York, hair and make-up artist York, bridal make-up artist York, make-up artist Yorkshire, bridal hair and make-up Yorkshire, fashion make-up, film make-up artist, wedding make-up York, wedding hair York, make-up lessons York, prom make-up Yorkshire, wedding hair, wedding make-up, Harrogate, Hull, Leeds, North Yorkshire, East Yorkshire.